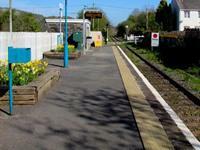 Llandybie railway station serves the village of Llandybie near Ammanford, West Wales. The railway station is located below street level just off Kings Road. This is a convenient stop for Glynhir Estate and Glynhir Falls. Two miles from the station is the Llandybie 18-hole golf course.